DMTC Travels and Vissits | modeltrucks25 | Fotki.com, photo and video sharing made easy. On may the 20th 2006 Arjan and I vissited Klaus Clever in Germany and spend an enjoyable day around his models, photo's, books and family. Since an invitation a few years ago we were finally able to visit Revell Germany. 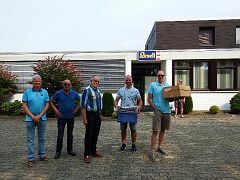 After a nice tour and some historic anecdotes by Ulli Taubert from Revell, we had a indepth discussion about trucks and trailers in the future of the model kit world and how Revell may or may not be involved in that future. All I can say is that it looks promising!